MicroRNA-146a-5p acts as a tumor suppressor in various types of cancer, including hepatocellular carcinoma, esophageal squamous cell carcinoma (ESCC), non small cell lung cancer (NSCLC) and prostate cancer. On the other hand, it is upregulated in melanoma and thyroid carcinoma. miR-146a-5p was observed to be downregulated in triple-negative breast cancer (TNBC) tissues and cell lines. 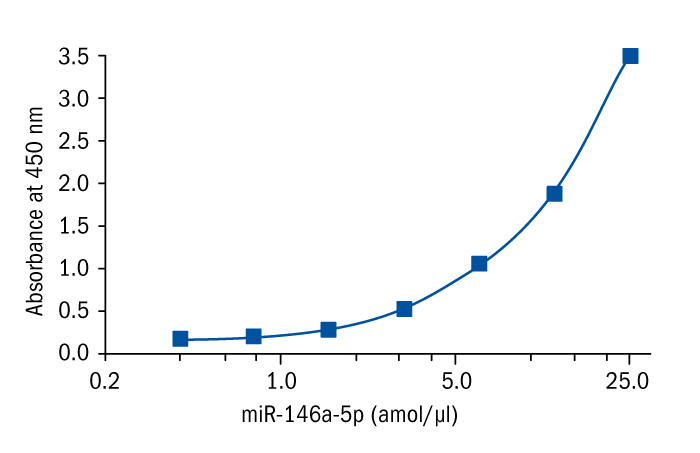 Additionally, miR-146a-5p could inhibit TNBC cell proliferation, migration and invasion, suppress expression of mesenchymal markers (N-cadherin, vimentin and fibronectin) and increase epithelial marker (E-cadherin) expression. Another study reported that miR 146a 5p was downregulated in hepatocellular carcinoma and acted as a tumor suppressor. miR-146a-5p level was significantly decreased in ESCC tissue and serum and it could act as a promising biomarker for the prognosis and diagnosis of ESCC. It was revealed that miR 146a 5p affected ESCC by regulating epithelial mesenchymal transition (EMT) progression. Furthermore, miR 146a 5p has been confirmed to inhibit non small cell lung cancer (NSCLC) cell proliferation and cell cycle progression. Reduced levels of miR-146-5p in serum exosomes were correlated with shorter progression-free survival and cisplatin resistance in NSCLC patients. Thus, serum exosomal miR-146a-5p may be a new biomarker predicting the efficacy of cisplatin for NSCLC patients and enabling real-time monitoring of drug resistance. Another study indicated that miR 146a 5p could promote prostate cancer cell apoptosis by targeting ROCK1. miR-146a-5p level was consistently increased in HCV-infected hepatocyte-like cells and primary human hepatocytes, as well as in liver tissue from HCV-infected patients. Over-expression of miR-140-5p, miR-140-3p, and miR-146a-5p reduced induced expression of cytokines IL1β, IL6, and IL8. The anti-inflammatory effects of these microRNAs were clearly shown by down-regulation of NFκB-p65 subunit and several inflammatory components in the NFκB pathway. The protective effects of the microRNAs in chondrocytes were also exerted by up-regulation of inhibitors of the NFκB- pathway. Forloni M, Dogra SK, Dong Y, Conte D Jr., Ou J, Zhu LJ, Deng A, Mahalingam M, Green MR, Wajapeyee N: miR-146a promotes the initiation and progression of melanoma by activating Notch signaling. eLife. 3: e01460 (2014). Sun M, Fang S, Li W, Li C, Wang L, Wang F, Wang Y (2015. a) Associations of miR-146a and miR-146b expression and clinical characteristics in papillary thyroid carcinoma. Cancer Biomark 15: 33–40. Chengshuai S, Qiao Y, Yufeng Y: Effect of miR-146a-5p on proliferation and metastasis of triple-negative breast cancer via regulation of SOX5. Experimental and Therapeutic medicine 15: 4515-4521 (2018). Zhang X, Ye ZH, Liang HW, Ren FH, Li P, Dang YW and Chen G: Down regulation of miR 146a 5p and its potential targets in hepatocellular carcinoma validated by a TCGA and GEO based study. FEBS 7: 504 521 (2017). Jinghua D, Xuemin N, Yang W, Lingbo K, Rongqi W, Yuguo Z, Suxian Z, Yuemin N: MiR-146a-5p suppresses activation and proliferation of hepatic stellate cells in nonalcoholic fibrosing steatohepatitis through directly targeting Wnt1 and Wnt5a. Nature, Scientific Reports 5 (2015). Wang C, Zhang W, Zhang L, Chen X, Guan S, Zhang J, Guan S, Sun Y, Chen P, Wang D, et al: miR 146a 5p mediates epithelial mesenchymal transition of oesophageal squamous cell carcinoma via targeting Notch2. Br J Cancer 115: 1548 1554 (2016). Wang C, Guan S, Guan S,2 Chen X, Han L, Wang D, Nesa EU, Wang X,4 Bao C,5,6 Wang N and Yufeng Cheng1: Prognostic and diagnostic potential of miR-146a in oesophageal squamous cell carcinoma. Br J Cancer. 114(3): 290–297 (2016). Li YL, Wang J, Zhang CY, Shen YQ, Wang HM, Ding L, Gu YC, Lou JT, Zhao XT, Ma ZL and Jin YX: MiR 146a 5p inhibits cell proliferation and cell cycle progression in NSCLC cell lines by targeting CCND1 and CCND2. Oncotarget 7: 59287 59298 (2016). Yuwen DL, Sheng BB, Liu J, Wenyu W, Shu YQ: MiR-146a-5p level in serum exosomes predicts therapeutic effect of cisplatin in non-small cell lung cancer. Eur Rev Med Pharmacol Sci 21(11): 2650-2658 (2017). Xu B, Huang Y, Niu X, Tao T, Jiang L, Tong N, Chen S, Liu N, Zhu W and Chen M: Hsa miR 146a 5p modulates androgen independent prostate cancer cells apoptosis by targeting ROCK1. Prostate 75: 1896 1903 (2015). Al-Modawi RN, Karlsen TA Sr., Brinchmann JE Sr.: miR-140-5p, miR-140-3p, and miR-146a-5p and their Protective Roles against Inflammation in Chondrocytes. Elsevier 25(1): 291-292 (2017).